One of the most common household pests are ants. But here in Alabama, you don’t only need to worry about ants as a household problem. You also have to worry about the biting and stinging variety that makes their homes in your gardens and lawn. If you’ve ever lingered unknowingly in the path of a fire ant, you understand why. Their bite and sting cause an initial pain followed by itching that can last for days.If you find crazy ants in your yard or house, you need to call us immediately for a qualified ant exterminator. These ants can destroy houses and crops. They need to be taken care of immediately. If you have an ant exterminator problem, you are probably determined to get rid of it, but before you begin you should first confirm whether your problems is, in fact, an ant problem rather than a termite problem. This is sometimes difficult as both insects look similar. There are, however, distinct differences between the two. When you look at an ant, you will see an insect with a segmented body, two sets of wings—a larger set of front wings and a smaller second set of back wings—and a set of antennas that are bent. When you look at a termite, you will notice a fluent body with two sets of equal length wings and fairly straight antennas. After you have determined that your infestation is, in fact, ants, you need to determine what species of ant you will be fighting. This is important because the treatments for certain species varies. Found in dirt mounds in the garden, lawn, and near building foundations, these red ¼” inch ants both bite from their jaws while stinging from their abdomen and are aggressive enough that they will sting their victim several times. If stung by a fire ant, a welt will form followed by a white blister.Carpenter Ants: Like termites, carpenter ants destroy wood, chewing on it to make their home then depositing it outside the colony entrances. While they tend to be outdoor ants, they will sometimes make their way into your home and build their nests by chewing on the wood causing damage to your home. Carpenter ants are red to black and grow to be ½” long. These yellow or gold ants are a smaller variety only growing to be 1/16” long and have black markings on their backs. They make their way into buildings to avoid the cold.Grease Ants: Similar to the pharaoh ant, a grease ant is often yellow, but they can also be tan or dark brown. The 1/16 -1/12” ants are generally seen in the warmer summer months and nest hidden in the walls and crevices of your home. Although called black ants, they can also be dark brown. Approximately 1/8” long, these ants feed on sugary foods, meats, vegetables, and other bugs and can be found making their colonies in both your home and outside in the soil.Crazy Ants: Dark brown or black ants that are 1/10” long and can be seen moving frantically. They are comfortable both inside and outside and tend to like electricity. Crazy ants gather near electrical sources, and upon electrocution, they send off a pheromone that calls to other crazy ants to come to their defense. Those ants are further electrocuted creating a pile of dead ants near the source. Ants that don’t bite, regardless of their species, are generally referred to as sugar ants.Pavement Ants: Nesting under stones and in sidewalk cracks, you will find the 1/10” black or brown pavement ant. Generally, these are outside ants, but they will enter your home looking for food and water. Like termites, carpenter ants destroy wood, chewing on it to make their home then depositing it outside the colony entrances. While they tend to be outdoor ants, they will sometimes make their way into your home and build their nests by chewing on the wood causing damage to your home. Carpenter ants are red to black and grow to be ½” long. Similar to the pharaoh ant, a grease ant is often yellow, but they can also be tan or dark brown. The 1/16 -1/12” ants are generally seen in the warmer summer months and nest hidden in the walls and crevices of your home. Dark brown or black ants that are 1/10” long and can be seen moving frantically. They are comfortable both inside and outside and tend to like electricity. Crazy ants gather near electrical sources, and upon electrocution, they send off a pheromone that calls to other crazy ants to come to their defense. Those ants are further electrocuted creating a pile of dead ants near the source. Nesting under stones and in sidewalk cracks, you will find the 1/10” black or brown pavement ant. Generally, these are outside ants, but they will enter your home looking for food and water. Because ants build colonies that can be populated by thousands, a single ant is a sign of many more. While most ants are sterile, a single queen can produce thousands in her lifetime creating frustration for homeowners. 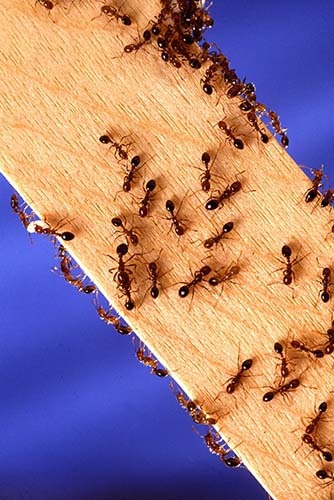 If you want to rid your home and yard of ants, contact Advanced Pest Control of Alabama, so we can identify the ant species and safely treat the infestation with the right insecticide.